To Cite: Sharifzadeh S, Ghasempour M, Hajebrahimi M, Rezaianzadeh A, Dehghan S. Evaluation of the Scientific Output in One of the Major Medical Universities of Iran, Shiraz E-Med J. 2014 ; 15(3):e22360. doi: 10.17795/semj22360. Background: In scientometric evaluations, the basic criteria for determining the scientific ranking of a country among others is the amount of participation in science production, creativity in technology, and its role in the world science production. Objectives: In this study, the trend of science production in Shiraz University of Medical Sciences during 1959-2011 was evaluated by employing scientometric techniques in Scopus database. Materials and Methods: All the documents indexed in Scopus database by researchers of Shiraz University of Medical Sciences during 1959-2011 were extracted. Results: A higher frequency of the published documents was seen in 2011 with 751 published works (16.39%). Moreover, the first indexed article was “Glutathione stability of the erythrocytes in Iranians” and the Iranian Journal of Medical Sciences was the core journal for publishing 259 of all the indexed documents and 99% of the documents were published in English Language. Conclusions: In this study, review of researches showed an increasing trend in scientific output during 1959-1978, but after the revolution and by initiating the Iran-Iraq war, a downward trend was seen. By the end of the war, a rapid growth was observed in scientific production. Establishment of research centers in different faculties of the university, increase in the number of master and doctorate degree students, and improvement of research budgets seem to be the important factors that this have affected growth trend. Today, the criteria of determining the power of the countries in the world and the basis of the development depend on the scientific output and research achievements. It is obvious that increasing the research-based activities and caring about this subject will result in progress and development in each country (1). In this regard, universities play a critical role. Furthermore, medical sciences universities have important influence on the health system of each society; therefore, conducted medical researches by these universities can be of great help to policymakers of the health system in making the best decision. Consequently, the number of the published articles in the health system can be a good determinant of progression and development of a country (2). Scientometric techniques are efficient and effective tools for evaluating the scientific production of researchers in universities. In recent years, Shiraz University of Medical Sciences (SUMS) has usually had the second or the third research rank among the medical universities in Iran. The present study aimed to evaluate the status of scientific data production in SUMS. In this study, all the documents indexed in Scopus database by academic members of SUMS from 1959 to 2011 were extracted. In addition, analyses were performed through the scientometric method. As the university was established in 1959 with another name, which was changed after the Islamic Revolution, we had to search published works affiliated with the former name, Pahlavi University. Besides, because of the segregation of SUMS from Shiraz University in 1987, the documents were searched by the medical faculty and the related hospital affiliations. A total of 4538 documents were found that were published during 1959-2011. The number of the documents, growth trends, authorship pattern, productive journals, language distribution, and highly cited articles were also extracted from the database. A total of 4538 published documents were found from the academic members of SUMS during 1959-2011. From 1972 to 1978, an increasing trend was seen in some years. However, a sharp decrease was seen during 1981 to 1992, while from 1993 to 2011, an upward growth was found in scientific production with its peak in 2011 (Table 1). The first indexed article from SUMS in Scopus was entitled "Glutathione stability of the erythrocytes in Iranians", which was indexed in 1959 with two citations. The authors of this article were Walker DG and Bowman JE. The second article entitled "Virtual absence of glutathione instability of the erythrocytes among Armenians in Iran" was published in 1961 by the same authors as the first indexed article. The third indexed article, which was written by Walker DG, Prasad AS, and Sadrieh J, was entitled "Free amino acid levels in ultrafiltrates of human blood plasma" and was published in 1962. Furthermore, the common subjects covered by the published documents were analyzed. 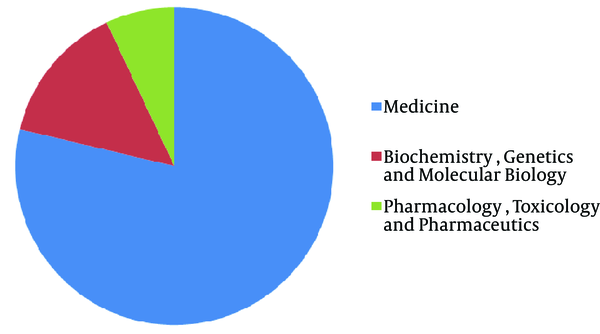 Overall, 3606 articles were related to medicine, 653 to genetic and molecular biology and biochemistry, 321 to the field of pharmacology and toxicology, and the rest were related to other subjects with lower frequencies (Figure 1). The type of the indexed documents in Scopus database during 1959-2011 is shown in Figure 2. A total of 3780 documents were indexed as original articles (83.29%), 428 (9.43%) as letter, 124 as review (2.73%), 80 (1.76%) as conference paper, 65 (1.43%) as article in press, 21 (46%) as note, 16 (35%) as editorial, 15 (33%) as short survey, and 9 (19%) as article erratum. 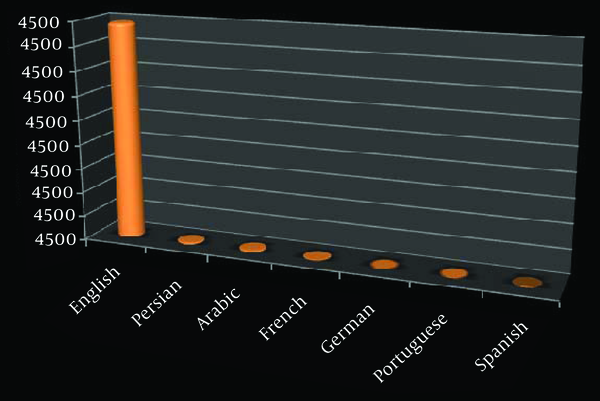 The language distribution of the documents was also analyzed and the results are illustrated in Figure 3. In this study, the journals with the most published documents were also analyzed and the results are shown in Figure 4. 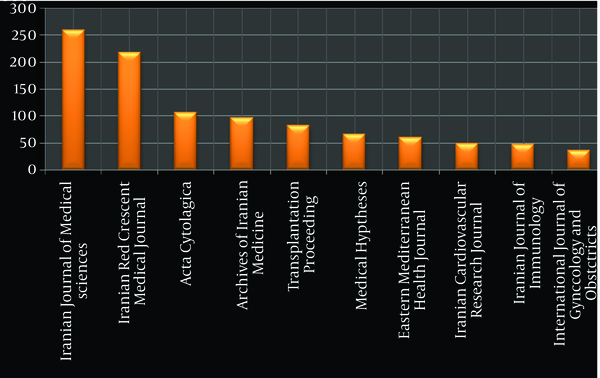 According to the results, Iranian Journal of Medical Sciences with 259 documents (5.70%) had the highest proportion in publishing these documents. Table 2 shows the highly cited articles. The first highly cited article was entitled “Hydrogel nanoparticles in drug delivery” with 179 citations, which was published in Advanced Drug Delivery Review journal. The second article with 112 citations was entitled “Antidiabetic effects of quercetin in streptozocin induced diabetic rats” and was published in Comparative Biochemistry and Physiology Part C: Toxicology and Pharmacology. The third highly cited article with 110 citations was entitled “The diversity of the effects of sulfur mustard gas inhalation on respiratory system 10 years after a single, heavy exposure” and was published in Chest. The findings of the present study showed that the scientific production of SUMS has increased during 1959-2011 with its peak in 2011. We had a sharp decline after 1979 until 1993 and then a rapid upward trend was observed until 2011. Totally, 91.72% of all the articles were published after 2000 with 78.87% of them published from 2005 to 2011. The sharp decrease after 1979 is concomitant to Islamic Revolution and soon after that when Iran-Iraq war started. Meanwhile, some visiting professors, mostly from the United States (US) and United Kingdom (UK), helped to educate the medical students, contributing to improvements in research design, and writing articles. It can be clearly observed in the authors of the three first indexed articles in Scopus database in 1959, 1961, and 1962 by SUMS. During the same period, some Iranian scientists emigrated from Iran due to the changes in the socioeconomic condition in the country. These caused a sharp decrease in scientific output. After 1993, we see an ascending trend in scientific growth with its peak in 2011. This incremental trend in scientific output was reported in many countries as reported by Gupta et al. (3). During 1998-2008 based on the number of indexed articles in Scopus, Indians hold the 12th rank among the productive countries in medical research with a global publication share of 1.59% (3). Cami et al. (1999) studied the scientific production of Spain health science and medicine from 1990 to 1993 using Science Citation Index (SCI) and Social Science Citation Index (SSCI) database and revealed an increasing growth in all the fields in their research (4). We can see an increasing scientific output in many countries but in comparison with other countries, this rate has been faster in Iran during recent years. In Iran, many studies were conducted in different scientific fields including medicine and were indexed in medical databases. All of these studies confirmed a sharply increasing trend in medical scientific output, especially during the recent decade (5-8). In some of those studies, the situation was compared among different universities (9, 10). Ghasempour studied the scientific production of the academic members of type I Iranian universities of medical sciences in the web of science database during 2000-2007. The results showed that among nine type 1 universities of medical sciences in Iran, Tehran university of Medical Sciences (TUMS) was ranked the first with 2917 published articles (34.47% of total). Moreover, Shahid Beheshti University of Medical Sciences (SBUMS) was in the second rank with 1508 (17.8%). SUMS ranked the third with 1224 published articles (14.66%). The peak of the scientific production was during 2006-2007 where 4661 articles (57.09%) were published (11). Abolghassemi and Fakhree studied scientific production in seven type 1 universities of medical sciences of Iran during 1961-2011 (10). In their study, TUMS had the highest rank among others based on the number of articles per year (NAPY). SBUMS and SUMS are comparable with each other in the second rank based on NAPY. Other universities had similar ranks after these three universities. Based on the results of this study, the overall ranking of seven top medical universities according to the number of articles and related citations are as follows: TUMS > SUMS = SBUMS > Isfahan University of Medical Sciences (MUI) = Iran University of Medical Sciences (IUMS) > Tabriz University of Medical Sciences (TBZMED) = Mashhad University of Medical Sciences (MUMS). It seems that normalization based on the number of staff, researchers, students, and budgeting per university is necessary for better conclusion because those factors definitely can affect the scientific output. As SUMS is not located in the capital city of Iran, it is not comparable with TUMS and SBMU in terms of budgeting and number of researchers but this university can be considered as the main university in Iran, especially in the south of Iran. In our study, 83.29% of indexed records were in original article format. Ghasempour et al. evaluated the indexed published records by type 1 Iranian universities in the web of science database during 2000-2007 and showed that 51.58% of them were original articles. In Abolghassemi and Fakher study, 88.7% of the published articles in seven top medical universities were original articles. Aminpour et al. showed that from 1963 to 2006, 84.5% of the total dental articles published in six different dental journals were original articles (9-11). It seems that original articles are the best choice for the researchers to impart their knowledge. This might be due to the unique specificity of original articles in comparison to the other types of articles. The scientific data in all fields must be reviewed and evaluated by specialists in that field in order to be useful for others. Moreover, the time consuming process of publishing a book and the limited number of audiences of conferences and seminars make the scientific data producers focus on publishing the original articles in journals. It should not be forgotten that the published articles are the main way of communication between the scientists in scientific and technical fields. In term of main languages in published articles, in our study, 97.76% of the articles were indexed in Scopus and published in English language. As English is the common language of science for scientific communication, it is expected that most published articles be in English language. Patra and Chand (2008) studied the scientific production of Indian scientists about AIDS during 1982-2005 (12). Their study was done using book searching and search in the web of science and PubMed databases. The results showed that all the 1542 articles found in PubMed were in English language. Along with the mentioned studies, we found some research indicating that the Farsi language was the main language for published articles. Assari and Ahmadyar (13) showed that 99.3% of dental articles were in Farsi language where a bibliometric analysis was done on electronically available literature. Aslani et al. showed that 90% of indexed articles concerning transplantation in Iranmedex were in Farsi language (14). We need to search total indexed articles in different databases including Iranmedex to find the language distribution of all published articles by SUMS researchers. Common subjects in our study were medicine (76.48%), biochemistry, genetics, molecular biology (14.4%), and pharmacology, toxicology, and pharmaceutics (7.1%). Our study confirmed the Abolghassemi et al. study, which reported that 82% of the published subjects by SUMS’ academic staff are in the field of medicine, 16.3% in biochemistry, molecular biology, and genetics and 7.4% in pharmacology, toxicology, and pharmaceutics. In this study, the second subjects for TUMS and SBUMS was pharmacology and toxicology with respectively 14.8% and 13.8% and after that biochemistry and molecular biology with 12.8% and 13.5%, respectively. The results indicated that in SUMS, medical basic science research growth was higher than other subjects in comparison with other two top universities (10). Author productivity was analyzed in our study and revealed that 20.86% of the total articles were written by ten productive authors. Assari et al. 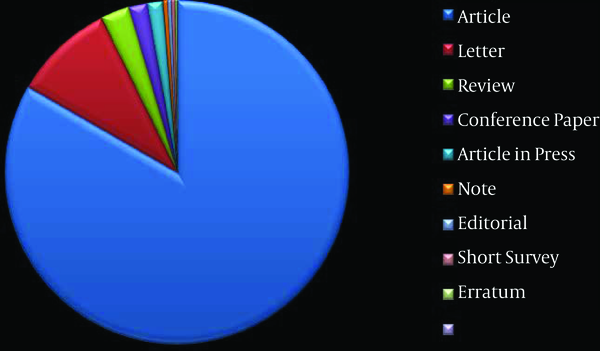 (13) reported that 38.7% of all published dental articles were written by two authors. In the study of Gupta et al., 15 productive authors published 2414 papers of all with the average of 160.93 papers per author and 3.7% of total published articles. According to the statistics in ISI, the number of published scientific articles in the field of medical sciences from 1999 to 2005 was 4249 with 1113 citations, which is significantly higher than the years 1980-1990 (3). In our study, the ten highly cited articles had 943 citations. It seems that some factors including the research subjects, type and impact factor of the journals, and collaboration with scientists from other countries affect the number of citations. In our study, four out of ten highly cited articles were related to pharmacology fields. We analyzed the distribution of journals of published articles and we found Iranian journals of medical sciences as the most frequent used journals for publishing articles. It seems that our researchers prefer to publish their findings as articles in our own journals. In the study conducted by Abolghassemi and Fakher, 3.3% of articles affiliated with TUMS and 4.6% of SBUMS were published in Archive of Iranian Medicine but 7.7% of articles affiliated with SUMS were published in Iranian journal of medical sciences (10). Archive of Iranian Medicine ranked the fourth in our study. After IJMS, other international Iranian journals like Red Crescent and Journal of Immunology were in the first ten journals. Around 50% of these ten journals are published in Iran and this shows the intention of SUMS researchers to publish in local journals, which might be due to simplicity of the publishing process. We studied the scientific output of SUMS by scientometric methods in order to find the advantages as well as the drawbacks of our research conditions and to compare our status to other type 1 universities in Iran. This information would help the university policymakers and would be useful for future decision making, ranking, and awarding in research area. Our analyses showed that, unfortunately, we had a downward trend during the Iran-Iraq war, which was related to socioeconomic conditions of that era. Emigration of some professors from SUMS, emphasis on medical education to a large number of students for delivering health services to all areas of country, and inadequate research budget were all important factors that account for a decade of decline in SUMS scientific output. After the end of war, improvement in research budgets, graduation of more master and doctorate degree students from medical universities, and establishment of more medical university faculties-affiliated research centers were important factors in increasing the scientific output (15, 16). Moin et al. (2005) evaluated the scientific output in Iran during 1967-2005 and revealed that in comparison with other 15 countries, Iran had an increasing growth in the world from 0.0003% in 1970 to 0.29% in 2003 (17). According to the sixth report on international comparative performance of UK research base, prepared in September 2009 by a Britain-based research firm, health and biological science research was doubled in just two years from 2006-2008 and the fast-growing scientific field in Iran was medical sciences with a growth of 344% (18). Our study confirmed their finding; however, there is still a gap between our medical research output with other universities in developed countries and also a few countries in our geographical region (19, 20). Therefore, health policymakers should increase their support in different aspects for medical research. It should be mentioned that research budget in Iran is still less than that in developed countries and our researchers achieved this output with limited budgets. Therefore, equality in research situations in terms of budgets and staff in medical universities by will make a good chance for academic staff to design high-quality research. In addition, the researchers would be able to contribute to science production by team working and focusing on solving regional health problems. Funding/Support: Shiraz University of Medical Sciences supported this study financially by the grant number 89-5200.